Lyndon’s message set the tone for Cardiff Day, a highlight of the University calendar where Cardiff donors, fundraisers and volunteers are invited to receive a heart-felt thank you and hear about the impact of their contributions. The wide range of Cardiff’s work is perhaps best illustrated by Lyndon Wood’s own support. The founder of insurance firm Moorhouse Group, Lyndon not only supports postdoctoral research with philanthropic giving but also provides internships to current Cardiff students. First to talk about that work was Matthew Vince (MA 2014, Religious and Theological Studies 2015-), recipient of the Jameel Scholarship – facilitated by Mr Jameel, a prominent supporter of Cardiff’s Centre for the Study of Islam in the UK. Matthew’s research looks at the ways British Muslims integrate their faith with secular workplaces and cultures. Uncovering the everyday challenges in the lives of British Muslims is hard work, and costly – it “simply wouldn’t be possible without the Jameel Scholarship,” said Matthew. Demonstrating these world-class capabilities was Dr Nichola Brydges, a Hodge Neuroscience Research Fellow at Cardiff’s Neuroscience & Mental Health Research Institute (NMHRI). Her work has already been successful in establishing the genetic basis and environmental factors behind mental illnesses. “We are at the very beginning,” promised Dr Brydges – setting her sights on “diagnosis, treatments and prevention strategies”. In perhaps the most powerful moment of the day, Naomi Owen (Journalism, Media and Culture 2015-) told attendees about how receiving the James Thomas Award (created by the parents of the School’s late academic) has supported and enabled her studies. However, receipt of the Award changed her outlook – and with the encouragement of her tutors she is now unashamed of her background. “By being a working class writer with experiences to share, a positive cultural intervention is already underway,” she said. Having being “consumed with dread that my life would never change,” Naomi now intends to undertake a Masters’ degree in Digital Media within the School – and said she would “never forget the kindness” of Dr Thomas’ mother, Barbara. Director of Development and Alumni Relations TJ Rawlinson adeptly summarised the difference that donations of time and money can make to students, research and the University as a whole. 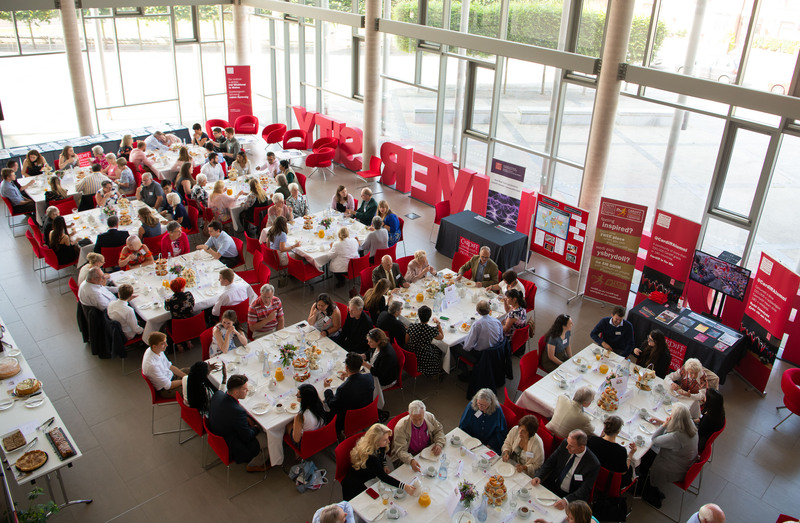 The contribution of donors, fundraisers and volunteers was writ large, and the overarching message of the day was one of thanks – from recipients of awards meeting their benefactors one to one, to the Vice-Chancellor personally thanking attendees. If you’re inspired by any of the stories from Cardiff Day, you can find out more about our fundraising priorities. Alternatively, by making a donation, becoming an alumni volunteer, or taking on the Cardiff University/Cardiff Half Marathon for #TeamCardiff, you can join us for the 2019 event!